Oct 22 Cinco Comidas al Dia! We have been a little quiet this week, because we have been so busy at school! We may only have lessons in the morning, but by the time you have had lunch and much-needed cerveza, done your homework and returned home, then there is little left of the day. Besides, it is very tiring being back in the classroom! Spanish lessons this week have been great! It is hugely rewarding and challenging, and we are in a small class with no more than 6 people and 2 terrific and enthusiastic young teachers. That said, concentrating for two lessons, each with a duration of 90 minutes, is fairly intense. That may not sound a great deal, but a huge amount of information is crammed into those two lessons: grammar, new verbs, new vocabulary, sentence construction, idiomatic expressions. Ultimately, we feel as though we are making progress, and after only 1 week that is some achievement. We have 4 more weeks to go in this particular tranche and will probably top up with more after Christmas. Being back at school, though, has also provided us with access to intercambio sessions (Spanish/English conversation in a social context), cultural tours and much more. Already, it has provided us with access to a different side to Granada, and we have met some lovely people. Today, a bit of a highlight, we learnt more about food in Spain and the eating habits the Spanish. Food is close to our hearts, as is drink, so this was music to our ears. We already new that the Spanish day tends to revolve around food: Mañana (morning) is the time of day typically from 06:00 until lunchtime at 14:00/15:00; la tarde (afternoon) runs from lunchtime until dinner time, which is typically at 21:00/22:00 and then la noche is from dinner time until 06:00. These periods are totally unrelated to the clock; meals dictate what period of the day it is. Desayuno - breakfast. 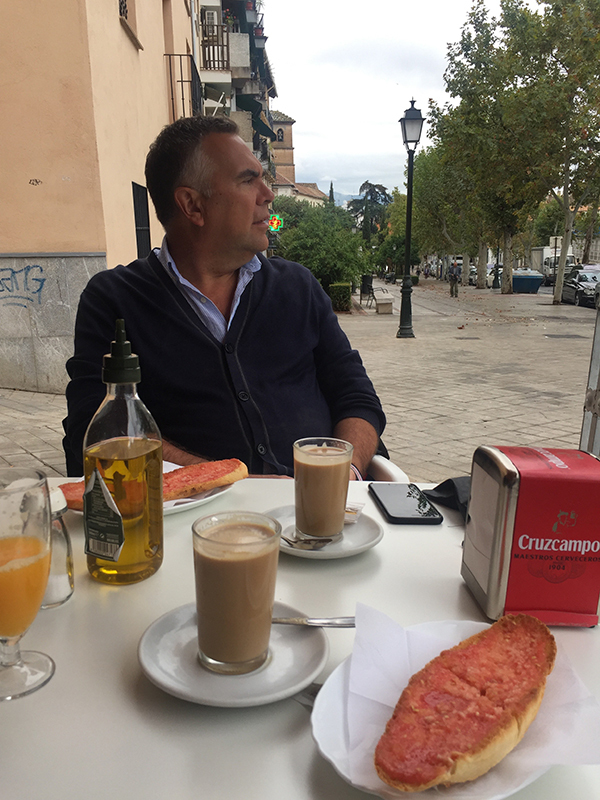 In Granada, popular breakfasts consist of churros or tostada (con tomate, or mermelada), and every region seems to have their speciality. Coffee is the predominant beverage, although it was discussed that some of the elder statesmen in towns will often partake of a cognac at around 10am! And why not? Media mañana - this is the equivalent of elevenses, taken at around 10/11 in the morning and basically coffee and pastries! At the mid-morning break between our lessons, it has to be said that a coffee is almost essential and a pastry never goes amiss. La almuerzo - lunch is normally the main meal of the day, with starters, main course and desert. I would always fall asleep if I had such a large lunch, but then that is what siesta is for! Go with the flow….It is VERY easy to settle down at a table outside a restaurant for one drink and get sucked into a round of additional drinks and tapas. One thing I have noticed since living in Spain is that I rarely leave a bar or restaurant without a feeling of great goodwill! La merienda - afternoon tea, anyone? This is a snack to bridge the gap between lunch and dinner, and our teacher was at pains to state that this is one of her favourites meals of the day as it involves, for her, cake. La cena - the final meal of the day, rarely taken before 21:00 and more typically at around 22:00, this would be lighter than lunch, although often consists of a couple for courses. My son developed a habit for what he would call ‘breakfast pudding’ which was, to all intents and purposes, a second course after his initial breakfast. I believe it may still be a habit he cultivates to this day, and it may have its benefits! It is certainly the case that, since I have been here, I eat smaller portions. You can choose not to have large plates of food; smaller meals, taken at regular intervals, seems to allow your body time to digest and let you know that you have had enough. Who knows if there is any biological benefit to this way of eating? All we can say is that we love it, and any nation where food is so central to the way of life is good in our books.